The most comprehensive online preparation course for UPSC IAS exams is now LIVE! For the best boundary-less experience of best learning, join LIVE now LIVE Course features (a) Full Syllabus Covered (for Prelims and Mains 2019) – more than 200 lectures to be conducted live (min 2 hrs each) - you attend online, all fresh classes (b) Online Course Material for download (PDFs, not hard copies) – more than 5000 pages of English or Hindi (your choice) (c) All lectures streamed online, and Archived after 2 days. You only need good quality internet. No DVDs or hard disk drives for this course. (d) Full access to our SRC – Student Resources Centre – updated with current content regularly (e) Full practice and Mock Test series – Online (not hard copies) (f) Full Access to PRABODHAN Mastercourse – high quality The Hindu newspaper editorial analyses (total 180 sessions LIVE) The Course will be online, so you need a PC and internet connection to attend it. View a Demo here! Details of the Course : Total Sessions = 200, Duration of each session = 120 min or more, Language used = Bilingual (English + Hindi), Many more supporting lectures on Aptitude also available Validity, Duration, Viewing Time : You get a total of 2000 hours viewing time in the course (for 1 year enrolment, valid till 31-03-2020). Core Faculty for the Course : Shri Sandeep Manudhane, ace trainer and faculty since 25 years, creator of PT education and PT’s IAS Academy, a contributor to newspapers, and a Quora Top Writer. Our Promise : You will have a complete package at your fingertips, tastefully designed, properly delivered and executed, with 100% freedom to learn from any device (though we recommended bigger screens) and at any time, anywhere in the world! Useful for : UPSC IAS exam, and all major government exams What we do not provide in the online version : Hard Disk Drive/DVDs, Printed Courseware etc. LIVE - PT’s IAS Academy – Prelims and Mains 2019 Course – your best solution! (This course is not related to our Self Prep Course or Gurukul Online course. No shifting is possible, please note) Full Fees Option : Rs.69,000/- only, including GST @ 18% Monthly payment Option : Total six instalments, all including GST. First - Rs.35,000/- (valid till 28th February 2019) Second - Rs.10,000/- (valid till 30th March 2019) Third - Rs.10,000/- (valid till 30th April 2019) Fourth - Rs.10,000/- (valid till 30th May 2019) Fifth - Rs.10,000/- (valid till 30th June 2019) Kindly pay monthly instalment before end of month to continue accessing all features and sessions. View a Demo here! The most comprehensive online preparation course for UPSC IAS exams is now LIVE! For the best boundary-less experience of best learning, join LIVE now LIVE Course features (a) Full Syllabus Covered (for Prelims and Mains 2019) – more than 200 lectures to be conducted live (min 2 hrs each) - you attend online, all fresh classes (b) Online Course Material for download (PDFs, not hard copies) – more than 5000 pages of English or Hindi (your choice) (c) All lectures streamed online, and Archived after 2 days. You only need good quality internet. No DVDs or hard disk drives for this course. (d) Full access to our SRC – Student Resources Centre – updated with current content regularly (e) Full practice and Mock Test series – Online (not hard copies) (f) Full Access to PRABODHAN Mastercourse – high quality The Hindu newspaper editorial analyses (total 180 sessions LIVE) The Course will be online, so you need a PC and internet connection to attend it. View a Demo here! 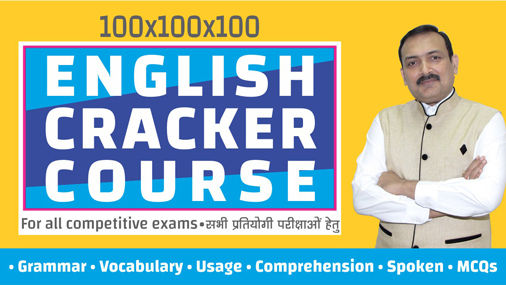 Details of the Course : Total Sessions = 200, Duration of each session = 120 min or more, Language used = Bilingual (English + Hindi), Many more supporting lectures on Aptitude also available Validity, Duration, Viewing Time : You get a total of 2000 hours viewing time in the course (for 1 year enrolment, valid till 31-03-2020). Core Faculty for the Course : Shri Sandeep Manudhane, ace trainer and faculty since 25 years, creator of PT education and PT’s IAS Academy, a contributor to newspapers, and a Quora Top Writer. Our Promise : You will have a complete package at your fingertips, tastefully designed, properly delivered and executed, with 100% freedom to learn from any device (though we recommended bigger screens) and at any time, anywhere in the world! Useful for : UPSC IAS exam, and all major government exams What we do not provide in the online version : Hard Disk Drive/DVDs, Printed Courseware etc. 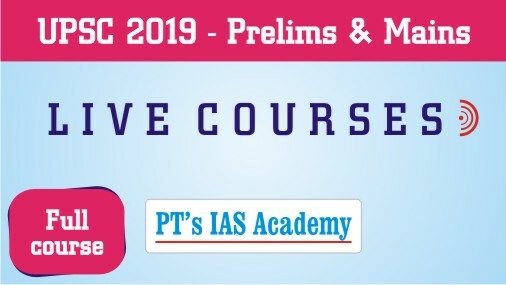 LIVE - PT’s IAS Academy – Prelims and Mains 2019 Course – your best solution! (This course is not related to our Self Prep Course or Gurukul Online course. No shifting is possible, please note) Full Fees Option : Rs.69,000/- only, including GST @ 18% Monthly payment Option : Total six instalments, all including GST. First - Rs.55,000/- (valid till 30th April 2019) Second - Rs.10,000/- (valid till 30th May 2019) Third - Rs.10,000/- (valid till 30th June 2019) Kindly pay monthly instalment before end of month to continue accessing all features and sessions. View a Demo here!